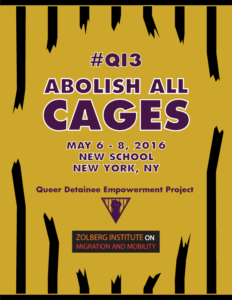 In early May, I joined LGBT-FAN colleagues to attend the third annual Queering Immigration conference, hosted by our Network member the Queer Detainee Empowerment Project (QDEP)* in New York City. Over a packed three days, we joined with activists, advocates and directly impacted community members to build, to borrow the organizers’ words, “a broader, queerer immigration support network”. Sessions covered approaches to housing, anti- detention organizing, addressing anti-blackness and misogyny within our movement, strategizing, fundraising, worker co-operatives and recent changes to immigration policy and legislation. The organizers also ensured that healing spaces and creative therapeutic activities were available throughout, providing an important outlet for attendees to process and reflect on our often-intense conversations. 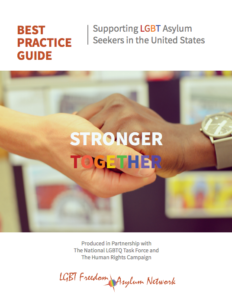 During the conference, LGBT-FAN led an interactive workshop on Stronger Together. Alongside my co-author Temitope Oke, LGBT-FAN Coordinator Greyson Brooks, and New York-based advocate Oliver Anene, we presented our key findings before asking attendees to share their own experiences and insights. The whole group shared their best practices for building partnerships with other organizations and service-providers, discussing various challenges to, and solutions for establishing strong collaborative networks. It was an energizing session, fitting in well with the tone of the conference. We documented the input of our knowledgeable workshop participants, and will shortly present their ideas and feedback on a 2-page document that can be used as a supplement to Stronger Together. Service-providers and impacted community members are best placed to improve LGBT-FAN’s work, and we hope to continue to provide opportunities for project evaluation and development in the future. Overall, and over the course of the weekend, LGBT-FAN members learned from other organizations and individuals working to build Alternative to Detention (ATD) projects, empower queer immigrant communities, and bring an end to immigrant detention across the United States. We built new friendships and connections, and look forward to working closely with QDEP and other similarly focused community-based and community-led organizations in the future. * QDEP is an Alternative to Detention (ATD) and post-release program, detention center visitation, direct service, and community organizing project that works with Lesbian, Gay, Bisexual, Queer, Two Spirit, Trans, Gender Non-Conforming, and HIV+ detainees and their families currently in detention centers, those that are recently released from detention centers, and undocumented folks in New York City. Tagged detention, Human Rights, immigration, LGBT Rights.